Bounded in by Madison Avenue, Vanderbilt Avenue, 42nd and 43rd Streets One Vanderbilt soon will stand as the tallest office tower in Midtown Manhattan. By its inclusion to the city landscape the building will serve the nees of the Midtown East real estate market being strongly tied with the Grand Central Terminal's civic improvement plan. This new commercial property will join and help cement the neighborhood's position as it joins the Chrysler Building and the Empire State Building towards redefining the Manhattan skyline. The building has been design like no other blending in with the city's pre-existing infrastruct One Vanderbilt fuses itself with the public transportation hub found at Grand Central joining the public scene to that of private enterprise. By that distinction the building is truely an amalgamate that brings terminal access at the doorstep to the greater city of which thousands travel daily... Its by these conditions that the property best serves the area with its convenience to the Terminal, Manhattan's East Side Access and that potent workforce who travels through daily. Externally the property has been constructed into four folding and contouring elements that twist their way upwards to the sky, a sinuous outline in harmony with the nearby Chrysler Building. At its foot the office tower bearsa number of facetted angles thats serve to draw both traffic and the eye towards Grand Central itself! Today this office building is under construction and will remain so for a few more years, as the floors go up more information will become available to us; if you'd like to stay on the pulse to this developement's activity just CALL or FILL our our Form (to the Right in Green). For updates on One Vanderbilt, contact us and one of our brokers can provide you with all the intel needed including price, floor plans, photos, and insight into the area and the comparable options. Total Building Size: 1,750,212 SF. Price: Buildings in this range and location today are averaging rents bewteen $70 to $90 PSF. 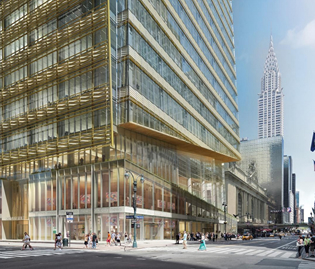 One Vanderbilt's facade and design is intended to integrate with Grand Central, across the street. 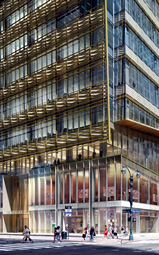 The building is advocated for by the Landmarks Preservation Commission due to its proposed environmentally friendly, Leadership in Energy and Environmental Design-conforming model.